Diabetes Mellitus (DM) is the leading cause for chronic kidney disease (CKD) in most countries worldwide, and given the increasing prevalence of DM, the burden of diabetic kidney disease (DKD) is expected to further increase in the future. Estimated glomerular filtration rate (eGFR) and proteinuria are currently the standard methods for assessing glomerular damage and kidney function changes in clinical practice. However, eGFR and proteinuria have limitations as biomarkers of CKD progression and response to interventions. Therefore, new non-invasive markers are needed to increase our understanding of the pathogenesis and progression of CKD. Magnetic resonance imaging (MRI) has great potential to non-invasively assess functional and morphologic changes in the kidney that may improve diagnosis, prognosis and treatment in patients with DKD. 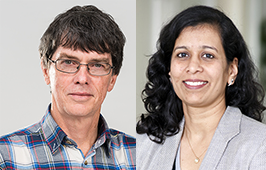 At this seminar, Seema Baid-Agrawal, MD, FASN, docent at Nephrology department at the Sahgrenska University Hospital, and Paul Hockings, director of imaging at Antaros Medical and Adjunct Professor at MedTech West, will present their recent results from the ongoing AM-01 study at the Sahlgrenska University Hospital and future work in this area. Using a comprehensive non-contrast MRI protocol that assesses novel MRI markers of kidney function and morphology in DKD population and healthy controls, the study investigates if these markers could differentiate between different CKD stages and identify patients at risk for progression of CKD. This is a collaboration research project supported and facilitated by MedTech West. Register at the latest at 16:00 on 22 April. A light lunch will be served to registered participants.